Listmas 2013 – Beer is Tasty! It’s day five of Blogger Listmas 2013! Every day from now through Christmas, I will be posting at least one list on a topic of my choosing. Most of them will be about games, but (possibly) not all of them. Hope you enjoy! For more on this, you can have a look at this roundup of all the posts, or follow the #Listmas tag on Twitter. I missed yesterday, and today is Christmas Eve, which means champagne! This year, my brother-in-law managed to secure a jeroboam from Scharffenberger which seemed like a lot! But then it was gone after only an hour and a half… Then, I remembered that I needed to do a post, so I’m going to follow through with the theme! Here are some of my favorite styles of beer, and an example or two of each! I am on the west coast, so that clearly influences things. Every day drinking – There’s lots of styles for this, but I’m thinking, generally, of lagers or ales here. Actually, that’s silly. I’m thinking of two specific beers. If I am just looking for something that suits pretty much any given day, I’m going to reach for either a Kona Longboard or a Rogue Dead Guy. Christmas/Winter Seasonals – This is my favorite beer season! My favorite is definitely Anchor Steam Christmas Ale. This is good every year, and if you can get it, I totally recommend it! Sierra Nevada Celebration is second, although, in actuality, it has been surpassed by some friends’ homebrew on a couple of occasions. Although, they are terrible about remembering recipes, so it never turns out quite the same. Neil is the best. He likes Anchor Steam normal. I do, too! Black IPAs – These are awesome. I homebrewed one this year with my brother, and it turned out very well! I got turned onto these at a tour at Widmer Brothers, where I had their Pitch Black IPA. I think my favorite overall is Wookie Jack from Firestone Walker. This is good stuff, and I can drink it pretty consistently. Sours – These are kind of expensive, which is unfortunate, because they are good! I especially like Kriek style ones, with sour cherries. Cascade makes a really good one. Everything I’ve had from Cantillon has been great, but it’s basically impossible to find. I definitely recommend splitting these with people, especially at first, because they can take a while to ease into. IPAs are sort of the standard “beer drinker’s beer” and I can definitely understand why people like them. But, sometimes, they get a bit over bitter for me. That said, I’m a fan of Pliny the Elder (which I can actually get reliably) and Stone IPA – for a relatively less bitter beer that is still hop-forward. I’m sure I’ve missed some! Remember that I’ve had plenty of champagne! It’s day three of Blogger Listmas 2013! Every day from now through Christmas, I will be posting at least one list on a topic of my choosing. Most of them will be about games, but (possibly) not all of them. Hope you enjoy! For more on this, you can have a look at this roundup of all the posts, or follow the #Listmas tag on Twitter. Mists of Pandaria has been out for over a year (although, I’ve been playing it for only a couple of months), and Warlords of Draenor is expected by this time next year. So it’s as good a time as any to start setting out goals for things that I still want to see/accomplish/attempt before the next expansion drops! Here are the top five for me. Complete all MoP raid instances on LFR (and hopefully Flex!) difficulty. Yeah, I mean, I know this one isn’t all that hard, but it’s something I still want to do! And, ideally, I will do it in a Flex raid so that I can do it with my friends (and maybe actually stand around and watch the cutscenes and understand what the hell is going on. Complete the Loremaster of Pandaria achievement. I think I’ve done this for all the other expansions (including getting pre-rearranged Loremaster), and I generally enjoy the questing and lore enough that I’d like to see it through at least once. Not sure if I will try to do it on both Horde and Alliance, but I will do it somewhere! Finish leveling my paladin to 90 via Monday Night Instances! This is the reason I’m even playing WoW again, and it’s been really fun. We’re going through every instance on the way from 1 – 90, by pretty much only playing as a group in instances. It’s been a great trip down nostalgia lane, AND I get to play with friends that I haven’t gamed with nearly as much as I would have liked in the last few years. Also, we mostly aren’t all wearing full sets of heirlooms, so sometimes we die. Proving Grounds – Specifically, get “You’re Doing it Wrong” The Proving Grounds is, conceptually, one of the cooler things that has been put into the game recently. I love doing difficult solo content in WoW, and I’m glad to have another opportunity to do it. The fact that there’s something extra for, say, doing a tanking challenge as a healer (or a healing challenge as a DPS), is really exciting! I expect it will give me a reason to practice a lot, and maybe even try to pick up some random purpose-focused gear. Get a Triceratops mount – I know there are a bunch of these, and one of them appears to be from reputation (and farming rep is always annoying), but I seriously must have one of these. I mean, just look at it! As always, there are some other things that I want to do, too. Pet Battles are fun, and the Celestial Tournament seems like the logical conclusion of that. 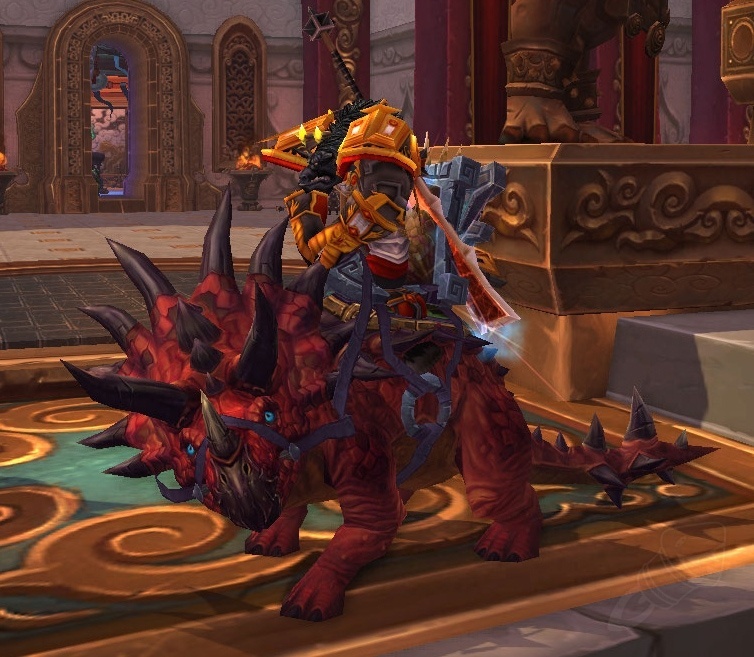 There are tons and tons of new mounts and pets to collect, which is always fun! I farmed a thing or two, and it seemed like an easy way to kill a bit of time each day, so I should probably figure out what all is involved. Oh, and now that I’ve committed a bit to a rogue, I am pretty tempted to go farm a blindfold from Illidan! As a follow-up to my post on my gaming backlog, I figured I’d put together a list of the top 5 games in my current backlog for day 2 of Listmas 2013. Of course, my backlog is deep enough that I had lots more games than that, so I’ve split it up into “normal” games and indie games. The lines are always a little blurry to me, so if I get one wrong don’t yell at me. Or do. Whatever. Beyond: Two Souls – I don’t care what anyone says, I loved Heavy Rain, and I am really excited to try this one out. I just expect that it will eat an entire weekend, so I need to have the time to devote to it. That’s why I put it at the top of my “when I finish games I’ve started” list. Assassin’s Creed (various) – I’m midway through AC:Brotherhood, and Ezio is awesome. I really want to see the rest of his story, and even though I’ve heard hushed rumblings of discontent with AC3 and AC:PIRATES, the core platformy/stabby gameplay is still fun to me. Plus, lots of people still love them, so I’ll judge for myself. The Last of Us – I started this briefly, but I think I will need to start it over from the beginning. It won lots of awards, and I really like everything else by Naughty Dog that I’ve played, so I’m looking forward to it. Dishonored – I picked this up in the Fall Steam Sale, and I’ve been meaning to get to it eventually. I like the idea that you can be stealthy, non-stealthy, and various things in between. Plus, the world seems pretty awesome to me. Saints Row 3 (and IV) – Every bit of these that I have watched or played has been awesome. But they are open-world enough that they are daunting to jump into. I aim to change that. Bastion – Rave reviews from everywhere, I’ve just never actually gotten around to it. It’s up near the top of my “what I am planning to play” list. The Walking Dead Season 1 – I’ve made it through 3 of 5 episodes, but it’s really, really stressful. I love the gameplay and the writing is great! But I am weak to the horror. Even this relatively low-level horror. So it takes some concerted effort. I will do it, though, and then I will play Season 2, which just came out. FEZ – I played this a bit at a friend’s house when it first came out, and have been sitting on a copy forever. I think I even have a copy on Steam now, too. Probably from a Humble Bundle. These things happen, but it always seemed like a lot of fun. Brothers: A Tale of Two Sons – Everything about this looked great, except the timing. I missed out on it when it released, but I still definitely want to play it! Viscera Cleanup Detail: Santa’s Rampage – Okay, yeah, I have no idea what is going on here. But Secret Santa gave it to me, and, well, it looks and sounds hilarious. So I’m adding it to the list. As usual, there are a number of other games that I want to play – Borderlands 2 DLCs sit unused, Mirror’s Edge has been sitting around for ages, my Fallout: New Vegas playthrough needs some love, LIMBO, Spelunky, and Trine are all indie games that I want to play. Plus, some older, hidden ones like Alan Wake, Mafia II, and a number of shooters from over the years. SO MANY GAMES. Cat Context Episode 41: Game Trivia Showdown 2013! A day late on my part, but so be it! Episode 41 of the Cat Context Podcast is now available! Since the year is almost over, we decided to do something a little different to celebrate. We had our first ever Game Trivia Showdown. Liore knew that she was no match for the rest of the team (and also that noone else would do it), so she put together a great set of gaming-related quiz questions! Arolaide and Ellyndrial teamed up with frequent guests Mangle and Ryven to answer questions, solve anagrams, and more. Liore played quiz-master, host, and arbitrary point-assigner. We had a great time with this episode, and we hope that it is as fun to watch/listen to as it was to record. With a group this large, we went the easy route on audio, so apologies if there are any issues with it. WHO WILL WIN?! Guess you’ll have to watch to find out. To listen, head on over to the official episode page, hit us up on iTunes, or check out our YouTube channel! Please continue to send in ratings, comments, and questions. We really appreciate them!